When De La Salle had ‘3-3-1’ sewn onto their training tops during the 2012 county championship, each number respectively being the target they had set for the club to have won the county, Munster and All-Ireland title by the end of the season, it drew widespread scorn, scorn that seemed justified when they came up short in the Munster final. There was another story to that loss, but for lots of people the message would have been clear – after hubris comes nemesis. After yesterday’s loss for Ballygunner at the hands of Cratloe in the Munster championship, I wonder whether we need to reappraise De La Salle’s cockiness. The Gunners are the undoubted kingpins of the county. You have to go all the way back to 1994 to find the last time that there were consecutive years where they didn’t make an appearance in the county final, and there is no doubt in my mind that their Munster title win in 2001/2 played a part in the loosening of the shackles on the county team in the years that followed. Which makes what I am about to say rather churlish, but I can only offer in my defence an assurance that what I say comes from a desire to see what is best for us all in general and Ballygunner as our representatives in particular. For it is a harsh truth that Ballygunner have underachieved in the Munster/All-Ireland stakes. Thirteen times they have advanced to the Munster championship and only once have they seized the crown. You ‘d think that experience would count for something, but looking at the teams who have beaten Ballygunner in recent years it seems the opposite is the case. Cratloe have only won two Clare titles, in 2009 and this year. 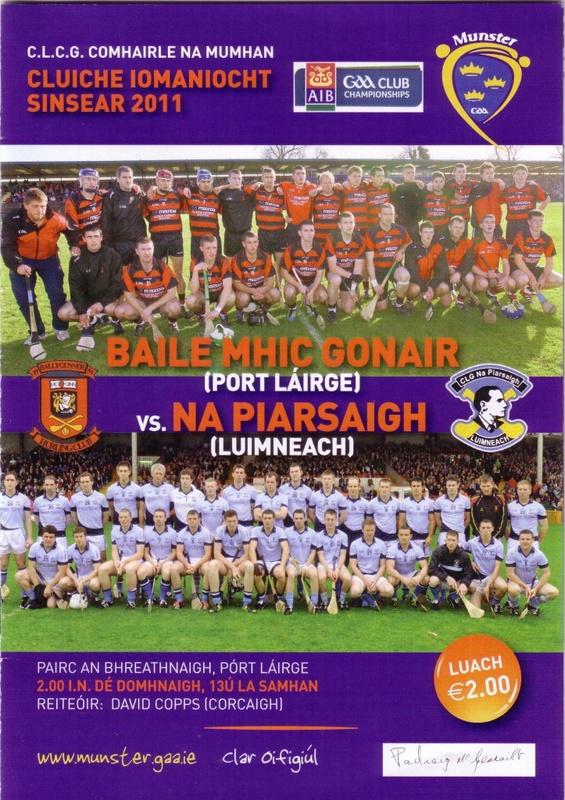 Na Piarsaigh of Limerick, Ballygunner’s conquerors in 2011, have also won only two titles – like De La Salle, those first two titles brought two Munster titles. Then there’s Newtownshandrum, who twice knocked out Ballygunner in the Noughties. Their purple patch of four Cork titles in that decade led to three Munster titles and an All-Ireland. All of this suggests that the shock of the new may be a better pointer to success in the club provincial championships than the experience of the old. Perhaps Ballygunner’s ‘experience’ is weighing heavily on them. Can you imagine them trying to put ’14-2-1′ on their training tops next year? Please note that I really wanted Ballygunner to win yesterday,eagerly/ignorantly hammering the refresh button on my Twitter feed while out for a meal with my in-laws in Liverpool. But it gives me one more reason for my usually-annual list on who I would like to see win the county title – skipped this year; rearing the 2038 Liam McCarthy Cup-winning Waterford captain is proving to be rather hard – to hope that neither Ballygunner or Mount Sion (sixteen appearances in the Munster championship, two wins) land the county title. This entry was posted in Hurling, Munster, Waterford and tagged Ballygunner, De La Salle, Munster on 27/10/2014 by deiseach. While reading around in the build-up to the county final last Sunday, I was mildly surprised to discover that the last time Passage played on the big day was in 1997, also against Ballygunner. ‘Surprised’ because I was at this game and in an ongoing reductive assessment of my own relationship with Waterford GAA, I assumed that game must have been after 1998 because hurling didn’t exist before then, did it? I’m not as bad an arriviste as I had assumed. These thoughts came up as I hoped that Passage might somehow turn back the tide of history. The loss in 1997 was their third in five years in the county final and while the current Ballygunner vintage might be a little more vulnerable than that team, for whom the win was their third win on the trot, even an arriviste would be able to see who were favourites. A prior engagement with the future Waterford All-Ireland winning captain meant I wasn’t going to make it but I wasn’t likely to miss much. Casting my mind back to the slaughter two years ago between the Gunners and Tallow and I was almost grateful to be missing out. Well, damn it. What a game, what a finish. Things can change quickly in club hurling. The last team to win the county title for the first time are now the team to beat in Waterford, while that three-in-a-row Ballygunner team must wonder where they went wrong in bequeathing a legacy robust enough to appear in thirteen of the last fifteen finals but win only five of them. Maybe in a few year’s time we’ll be looking at Passage as the team to beat. Maybe it’ll be an outlier in a series of disappointments for them. But the first time will always be the best, and it can’t be taken away from them. This entry was posted in Hurling, Waterford and tagged Ballygunner, County Championship, Passage on 17/10/2013 by deiseach. have you undergone a rapid rise from the Intermediate / Junior ranks? With De La Salle out, the Big Two from the city loom large, winners of forty-seven titles between them and fifteen in the last twenty years. The Monastery men may not be the force they once were but old habits die hard, not least when hearing the tale last Monday at the Minor homecoming from an Erins Own man who was my mother’s neighbour in Poleberry, of how certain members of their alone-it-once-stood Harty Cup win in 1953 were ringers (money quote – “I asked him when Clover Meats became eligible to play in the Harty Cup”). Yes, I realise it was a very long time ago and I really should grow up about such a story rather than getting a perverse delight in it. Still, I’m not in the humour to grow up just yet, and it’s not really a tie-breaking story. You’d want to be a right killjoy to be neutral and wish ill on Passage (county titles: 0). The same is true of the other semi-final. It has to be Abbeyside all the way (county hurling titles: 0). When you look at the spread of clubs represented in the Waterford team in Croke Park on Sunday week last, it would be an affirmation of the robust strength of hurling in the county should we have new names on the county cup. Given the criteria established above, it would look like Abbeyside would be the favoured choice of the neutral. Since Lismore won the title in 1993 the trophy has only once gone out past mid-county, to Ballyduff Upper in 2007. It would be nice to see that rectified. However, there’s one caveat to that – football. Abbeyside have had plenty of success in the guise of Ballinacourty, and there’s no one telling me that they are different clubs. So let’s all hope and pray for a Passage win. And prayer is what they’ll need, for with my imprimatur they are surely doomed. This entry was posted in Hurling, Waterford and tagged Abbeyside, Ballygunner, County Championship, Mount Sion, Passage on 16/09/2013 by deiseach. This year I was too lazy busy to do it from the quarter-final stage, so we find ourselves at the semi-finals shorn of the defending champions as Ballygunner went down to Mount Sion. The Gunners-Sion game might have presented a bit of a dilemma had I managed to get my act together before the quarter-finals. I’ve been pondering of late whether I’m being too hard on the Monastery men. It’s a source of some pride for our county that we have such a robust presence in one of the truly urban areas of Ireland and the recent travails of Mount Sion would make you wonder whether they could be heading the same way as Erin’s Own before them. Would I have wanted Mount Sion to topple Ballygunner, the club who have so flattered to deceive when they ventured outside the county as our representatives? Not putting together a crib sheet before the weekend has spared me the choice. Mount Sion were only playing with our minds. They’re still evil. Factor in the ease with which De La Salle seem to adapt to the burden of being county champions (two county titles, two Munster titles, two losses to the eventual All-Ireland champions) and more personal angst, and the all-city clash is a no-brainer. DLS all the way. The other fixture is much more intriguing. A quick Google reveals that Dungarvan have not won the county hurling title since 1941 and Fourmilewater have never even reached the final. There’s obviously a clear difference between the size of the respective clubs, with the Dungarvan the winningest (to use that awful, but awfully useful, American phrase) team in the county football championship, so you’d think that ickle Fourmilewater should get the support of all right-thinking neutrals. But wait, who is that further down the football roll of honour? The Nire have won the football championship six times since Dungarvan’s last win and as any fule kno The Nire and Fourmilewater are the effectively the same club. Not quite the David and Goliath clash it seems. And yet it is. I have a fondness for the Nire valley since happy days spent there with the Cub Scouts back in days of yore. We were all only too eager to jump on the Ballymacarbry bandwagon when the ladies footballers were sweeping all before them in the 1990’s, and it would be great for them to get something back. Factor in the marvel that is a club with as small a catchment area as the Nire valley fielding two competitive senior teams, and how could you object to Michael Ryan’s lot landing the big one? You couldn’t. Come on Fourmilewater. 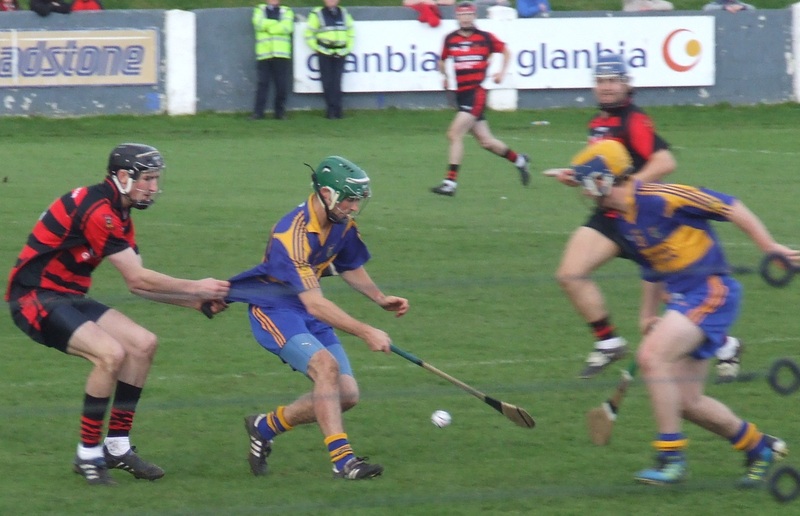 This entry was posted in Hurling, Waterford and tagged Ballygunner, County Championship, De La Salle, Dungarvan, Fourmilewater, Mount Sion on 19/09/2012 by deiseach. The gaps between games are an endless source of grist to the mill of those discussing Gaelic games. If a losing team waited a few weeks more than their opponents then they came into the match cold (see: Waterford v Clare 2000). If a losing team played successive matches in a short space of time then they tired from going to the well once too often (see: Waterford v Limerick 2007). Which was which is naturally only clear after the game, yet is clung to by the person promoting the idea as if it were the wisdom of Solomon. The only constant is that it always seems to be the Waterford team that gets bitten by it (see: this game). If you coherently believe in either philosophy as opposed to wearing it as a badge of post-match convenience then this match would have been a good argument for staying fresh. Not only were Na Piarsaigh without a match since the Limerick county final but they also came out onto the pitch at 1350, giving them about five minutes to warm up. Even the most buff of sportsmen has to limber up before action so you would have thought this would county against them. The earliest exchanges suggested not, with Na Piarsaigh earning an early free in a scoreable position which was hit wide by Shane Dowling. 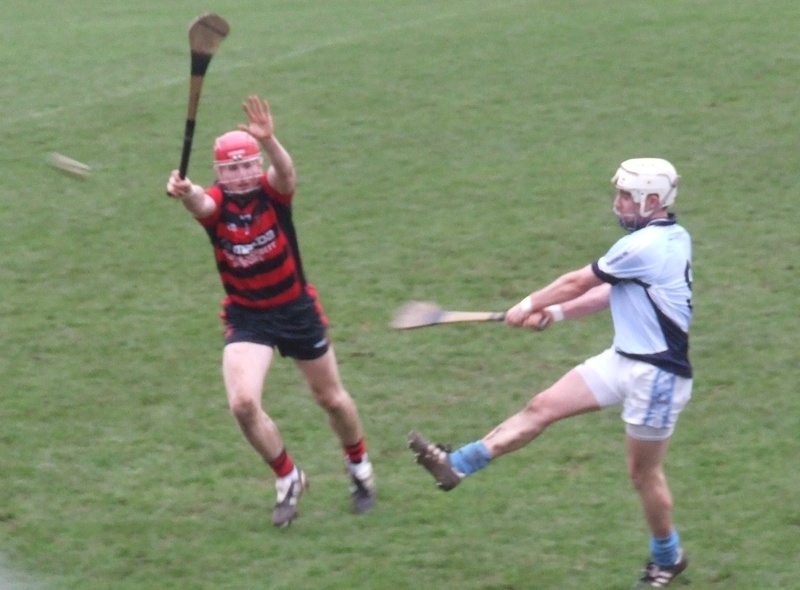 The wind was firm and in Ballygunner’s favour so they were going to need to impose themselves early on but Na Piarsiagh held their own to begin with. Shane O’Sullivan gave Ballygunner the lead with a fine effort from way out and a poor puckout from Padraic Kennedy gave him a chance for another score after being teed up by David O’Sullivan but dragged his shot across the face of the goal. Na Piarsaigh struck back with a point from Kevin Ryan – first point in Munster championship hurling etc – only for Ballygunner to hit straight back, a delightful ball from Shane Walsh (who had a fantastic game in the half-back line) picking out JJ Hutchinson to score. 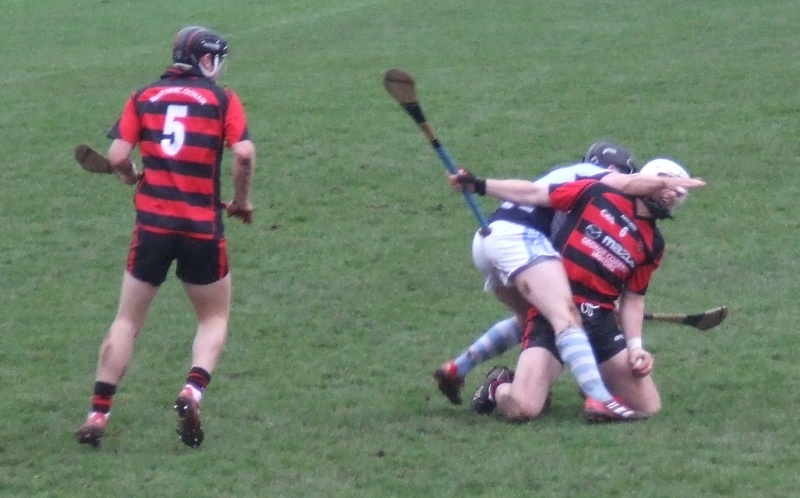 Na Piarsaigh seemed to be over-complicating things at times with lots of short puckouts that Ballygunner seemed content for them to take to little great effect, but keeping it tight can have its moments as they worked the ball cleverly up the field for Ryan to score his second point and level matters. The wind was obviously going to be a factor, a puckout from Stephen O’Keeffe going to between the half and full-forward lines and while David O’Sullivan could only hit the chance wide Ballygunner started to show some of the form they were going to need to win this. Stephen Power had a goal chance after another long clearance eluded everyone and ran through to him in the full-forward line but he elected to pull first-time on the ball that was on a surface one step above quagmire proportions and the chance was gone, although Pauric Mahony followed up with a point to put Ballygunner back in front. Mahony then benefited from a rather soft free after a foul on Power to stretch the lead to two. With Walsh and Harley Barnes beginning to assert themselves in the half-back line and midfield Ballygunner were now on top, Shane O’Sullivan getting another point from play after a neat exchange of passes, and there was an encouraging moment at the other end when Kevin Ryan seemed about to get clear but was hustled out by the Ballygunner backs without giving way a free. A galloping run by Shane O’Sullivan was abruptly brought to a halt and Pauric Mahony did the needful moving the Gunners four points clear. They were definitely in the ascendancy and another goal chance presented itself to Power as he managed to barrel his way through the defence. 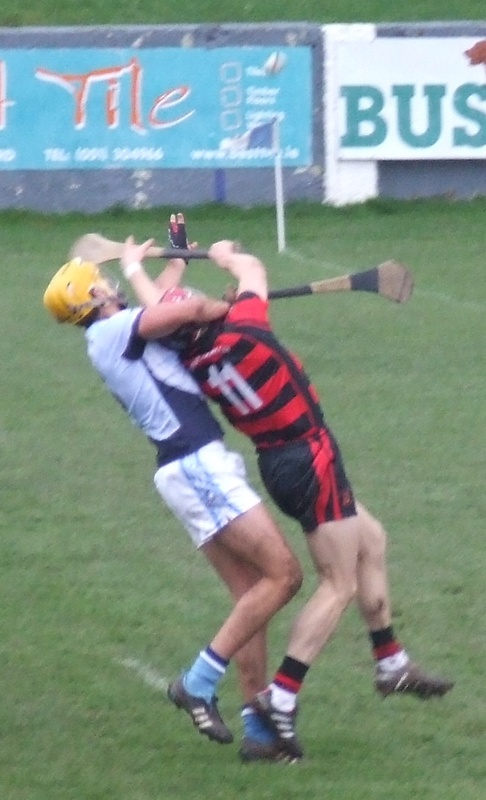 It was begging to be kicked to the net but this was always going to be tricky on the surface and Na Piarsaigh had enough bodies back to get it clear but only as far as Brian O’Sullivan who notched Ballygunner’s seventh point of the game. Na Piarsaigh were living on scraps, and you thought they couldn’t afford to spurn simple chances like Shane Dowling did when put into space by Kevin Downes (remember him?). On the other hand much the same could be said of Ballygunner with that wind blowing down towards the Keanes Road end and they hit two poor wides, the first when JJ Hutchinson tried an effort from an acute angle, then David O’Sullivan shooting wide from miles out when there was time to advance into a better scoring position. 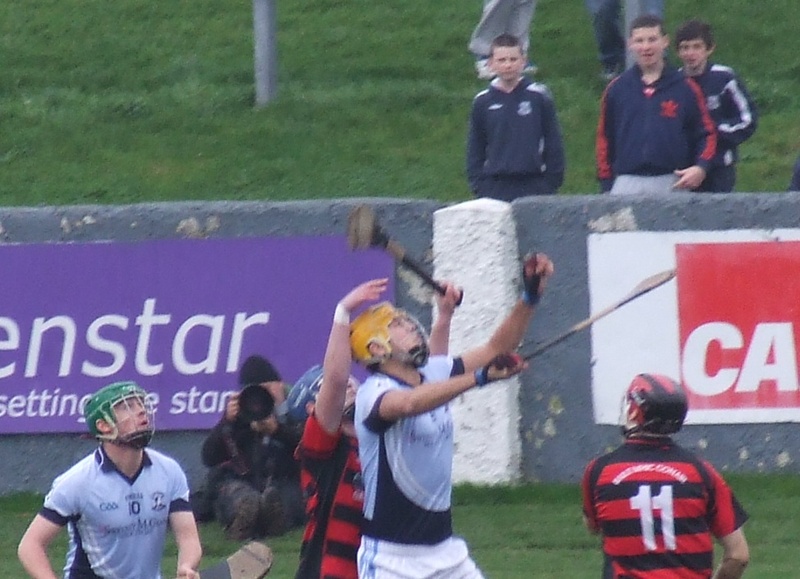 Na Piarsaigh persisted with the short puckouts and Ballygunner generally behaved as if this wasn’t something to worry about, much to the chagrin of the crowd. And generally they seemed to be right, a point from Adrian Breen after a knockdown from Downes not being obviously linked to policy of short puckouts. Ballygunner were going to win this one by playing their own game and to hell with the opposition’s best-laid plans, right? When you see points as good as David O’Sullivan’s score, picking up the ball in oceans of space after some stirring hurling from Wayne Hutchinson then the answer has to be hell, yes! Then again, you can only go on so long not taking the bait and Brian O’Sullivan caught Cathal King in possession after yet another short puckout And you just knew that David Copps was going to five a free-out. The man beside me opined that Cork refs have a down on Waterford teams, which is possible I guess. Personally I think refs seems curiously reluctant to give a free-in in those positions, as if it’s depriving the defence of a ‘fair’ chance of getting the ball away rather than a just punishment for acting the maggot. Worse still he then gave Ballygunner a cheap free for a hard-to-spot tug on a red-and-black shirt, thus cravenly making up for his previous behaviour. Pauric Mahony slotted over the free and we soon saw the value of a reliable freetaker. Shane Dowling scored one free after a blatant high tackle on Pat Gleeson, but he then missed another relatively easy free after Downes had been fouled. It was a poor effort from a player who clearly comes from the Paul Flynn school of closing your eyes and hitting the free as hard as possible through your waist. Mahony showed him how it was done moments later with a monster effort from way out and the half-time whistle went with the feeling of a two-point swing in favour of the Gunners. It was a handy lead for a sixty-minute game and you felt that if Ballygunner could get a goal at any stage they’d be home and hosed. I’m reluctant to explain the second half debacle on the basis that Ballygunner took it easy or were too casual as one the usual knowitalls would say when they were in full retreat late in the second half – it also seems ‘goals win games’; free insight that would be a bargain at twice the price. But with the benefit of hindsight an incident early in the second half takes on greater significance. Wayne Hutchinson won the ball and having shrugged off his marker turned to see who to pick out. And while Shane O’Neill drifted up behind in the wrong part of the field altogether it was more surprising that no-one on Ballygunner’s side, either on the pitch or the stand, felt the need to warn Hutchinson of the danger. Complacency? Perhaps. It was hard to see how Na Piarsaigh would turn this around, wind or not. They would not register a single score in the first ten minutes of the second half and on three occasions would hopelessly overhit balls into the full-forward line, twice seeing the ball cross the endline with just one bounce. Fouling Shane O’Sullivan when he was heading away from their goal spoke of a team who didn’t know what they were doing. Another free from Mahony after Brian O’Sullivan had put the head down and drawn the foul stretched the lead to seven and at this rate by the time they’d adjusted to the conditions Ballygunner would be out of sight. One thing I can say for certain without the benefit of hindsight is that I didn’t think much of Shane Dowling’s free-taking (see: above).When Alan Dempsey drew a foul right underneath us in the middle of the stand I didn’t worry too much when Dowling came trotting back to take it. So it was quite the jolt to see him launch the ball over the middle of the black spot with plenty to spare. Moments later Pauric Mahony was the victim of a bizarre piece of refereeing on the halfway line, penalised for overcarrying when he had barely set out on his run and this one went the same way, a Herculean strike that led to the kind of ‘cult hero’ fist-pumping that is great when one of your own does it and a colossal irritant when the opposition do it. Although not as irritating as the way Ballygunner suddenly began flapping around like a beached whale, Shane O’Sullivan squandering a decent chance for a score then fouling Kevin Downes at a range that even Dowling, with his dodgy mid-range targeting system, could not miss. How had this become a four-point game? Ballygunner were totally rattled, evidenced by Stephen Power trying to charge through then seeming to decide in mid-stride that they needed a score and being completely off-balance as he spooned the ball wide. This flub was nothing though compared to the calamity that came next. 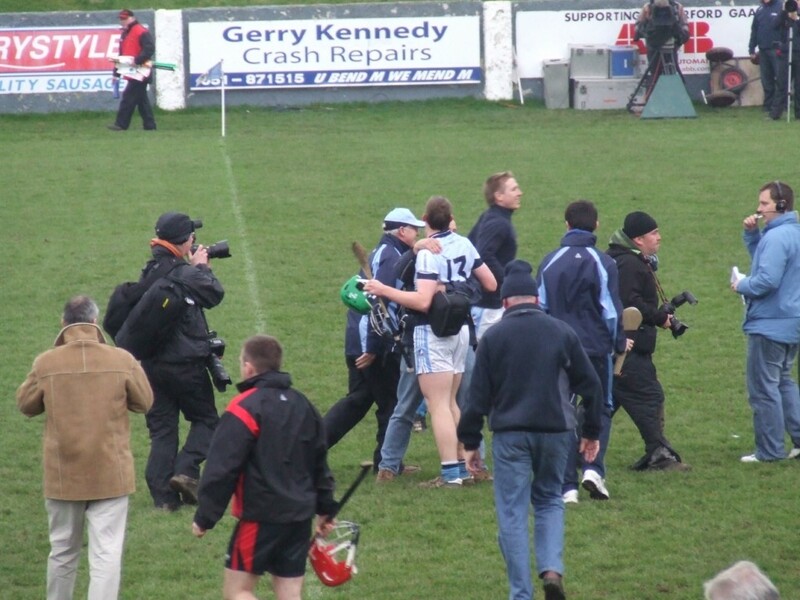 A long ball drifted through to Stephen O’Keeffe who got himself into all kinds of bother as he tried to slalom past the Na Piarsaigh full-forward and ended up stumbling as he tried to flick the ball to safety – it looked like a trip but the lack of outrage from his teammates suggested otherwise. The ball fell to the now-energised Shane Dowling who still had a lot of work to do despite the goalie being on the ground. He smashed a brilliant shot high into the net past the helpless backs who had tried to cover and now it was one-point game. You wouldn’t have taken any odds at his point on Ballygunner hanging onto the lead, their hopes lying with the player who mysteriously hit the deck just after the goal. It spoke volumes about my future expectations that I huffily noted the ref probably wouldn’t add the injury time accumulated while he got treatment- there I was, hoping for more time even though they were in front! Not for long though. Na Piarsaigh’s second goal featured several assists from Ballygunner as they worked the ball backwards, each player increasingly fearful of trying something creative. Eventually Kevin Ryan dispossessed a Ballygunner back, carved a path through the defence and played in Dowling who had the simple task of drilling the ball past the exposed O’Keeffe. Remember that comment about a Ballygunner goal surely sealing the deal? Now you felt they needed a goal at all costs just to insulate themselves against the score Na Piarsaigh were likely to get. Substitute Barry O’Sullivan tried for a point only to see the ball drop into the goalkeeper’s lap from where JJ Hutchinson managed to force a 65. Mahony magnificently pointed against the wind but the riposte from Na Piarsaigh was instant, Pat Gleeson hoiking the ball over from the halfway line and inducing more of nauseating yahooing. Ballygunner had a glimmer of a chance when Power attempted to double on dropping ball from Mahony. It was exactly the kind of foolhardy gesture that was needed and had he connected with it right it would have been the type of netbuster upon which Homeric sagas are written. Sadly he didn’t connect right, and after Kennedy recovered from being fouled – don’t forget to add the time, Mr Referee! – Na Piarsaigh landed the killer blow. Or, more pertinently, Ballygunner shot themselves in the foot once more. More indecisiveness in defence allowed Na Piarsaigh to get the ball across the face of the goal where we were treated to the agonising sight of Downes letting Ballygunner off the hook with his airshot only for Ryan to follow up to prod the ball to the net. When they’re literally queuing up to have a go, you know you’re licked. Ballygunner tried until the end. Maybe they were complacent – I certainly was – but you can’t accuse them of giving up. They repeatedly tried to jink their way through the Na Piarsaigh rearguard but the only time they threatened was when Brian O’Sullivan managed to get clear in the right corner only to be given a free, as useless an award as you can imagine because the free was in no way a goalscoring chance. Stephen Power had a lash anyway but it was cleared. The last score went to half-back Brian Hartnett, a fine effort from distance typical of the kind of thing that goes over when the champagne is flowing. And with that, a run of three successive Munster final appearances by Waterford teams came to an end. It was a dispiriting defeat. The big picture was bad. The ejection of the Kilkenny county champions and the presence of so many relative newcomers on the All-Ireland stage meant a path was opening up for Ballygunner and they couldn’t take it. The little picture was worse. 3-5 to 0-1 in the last twenty minutes is a hammering by any stretch of the imagination. And it feeds back into the big picture of Waterford teams lacking what it takes to go all the way. Michael Ryan has a lot to mull over during the bleak, hurling-less (for Waterford anyway) winter months. 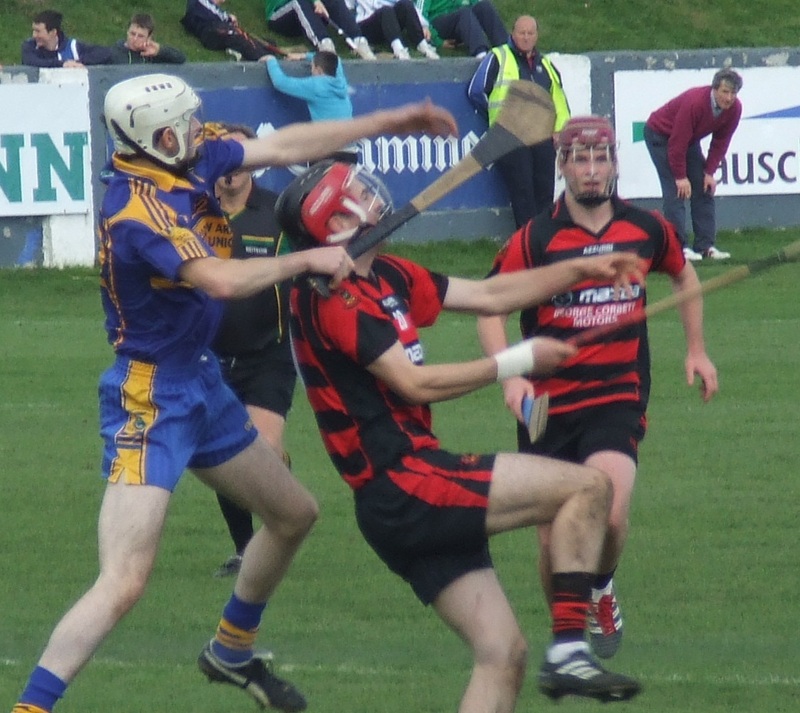 This entry was posted in Hurling, Match Reports, Munster, Waterford and tagged Ballygunner, Limerick, Munster, Na Piarsaigh, Walsh Park on 14/11/2011 by deiseach. 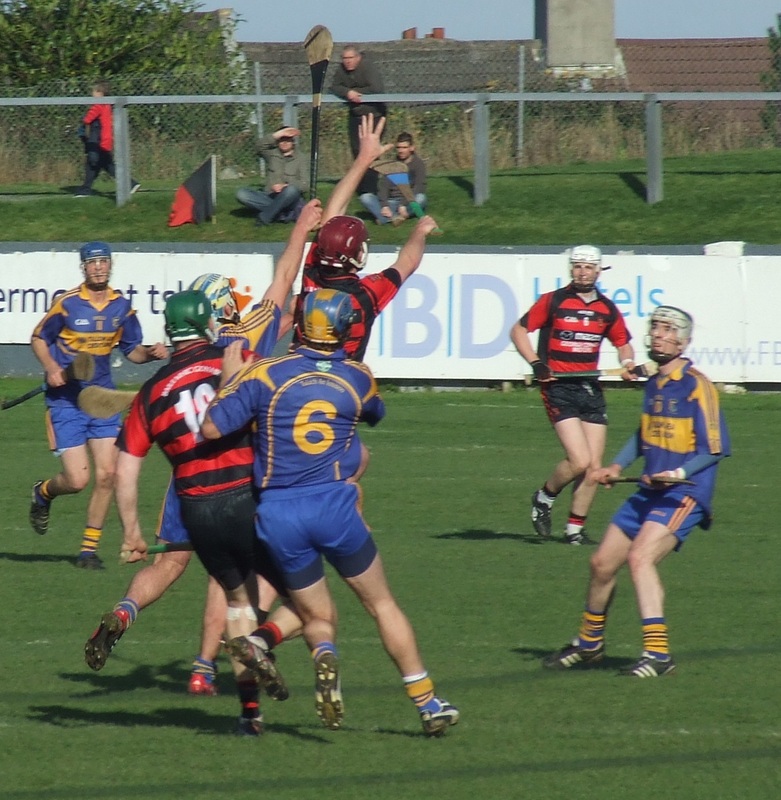 This entry was posted in Hurling, Munster, Waterford, Waterford gallery and tagged Ballygunner, Munster, Walsh Park on 13/11/2011 by deiseach. With Ballygunner getting ready to have another tilt at the Munster club title, it seems like a good time to roll out the complete list of results for Waterford clubs since the competition started in such a half-assed fashion back in 1964. Complete, that is, except for Lismore’s result against Ballyduff of Kerry in 1992. The Irish Times didn’t think it was worth noting, Feel free to comment on the Old Lady of D’Olier Street (yes, I know it’s not there any more) and its derisory attitude to the GAA below (Update: got it. Unsurprisingly the Indo is a bit more thorough). Our record isn’t as bad as I expected it to be. It’s certainly a lot better than our record at Under-21 level, a competition that started around the same time. We’ve a winning record against Limerick teams and a surprisingly good one against Tipperary teams. Tipp’s county championship is ferociously competitive with nine different winners over the last 20 years compared to only five in Waterford, so their teams are probably not as robust as the likes of Ballygunner and Mount Sion. Aha, you may say, how does that explain our crappy records against teams from Cork and Clare? Our recent efforts against Cork teams haven’t been so bad, but in the early days of the competition we were routinely mown down by the likes of Blackrock, Midleton and St Finbarr’s. It’s been a while since a team from Cork was inherently scary. The same cannot be said of the Clare champions. The hoodoo the Banner had over Waterford teams in the ’90’s was brutal, knocking us out no fewer than nine times in the twelve years between 1991 and 2002. Mount Sion didn’t beat Sixmilebridge in 2003 – they exorcised them. Now if only we could get all Max Von Sydow on the Galway champions . . . 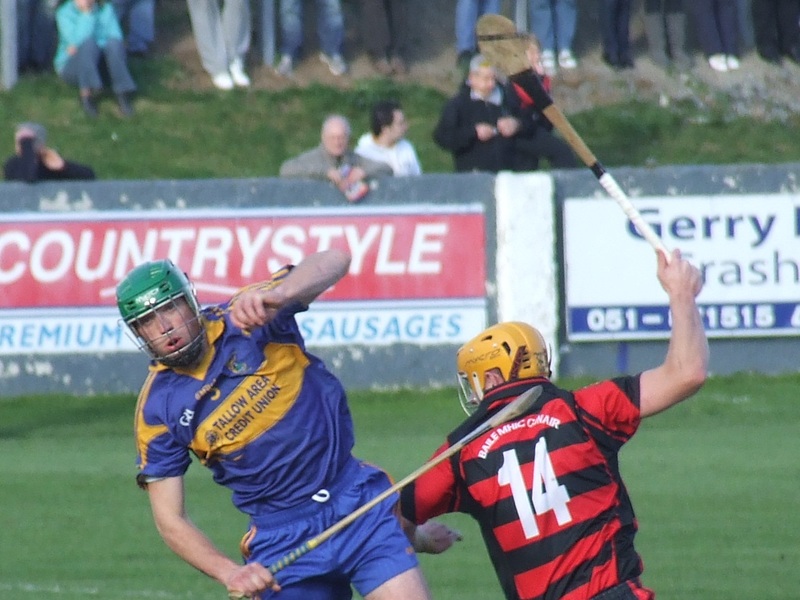 This entry was posted in Hurling, Munster, Results Archive, Waterford and tagged All-Ireland, Ballygunner, Clare, Cork, County Championship, Galway, Kerry, Limerick, Mount Sion, Munster, Tipperary on 26/10/2011 by deiseach. Karren Brady, speaking literally decades ago on Fantasy Football League, said that her hope for Birmingham City that year was to get through to the end of the season without being relegated and that they could all start at zero the following season. It may seem trite, but it did capture the essential optimism that pervades the start of every year and match (NB Birmingham were relegated to the third tier of English soccer that season) and you could see it in this match as Tallow seemed to be giving Ballygunner a game. They were struggling to win the ball but when they did get it they were engaging in all manner of deft flicks and low balls into the corner. Could the mighty Ballygunner be brought down by the sling-wielding Birmingham Tallow? Unfortunately this was more akin to someone taking a knife to a gun fight. 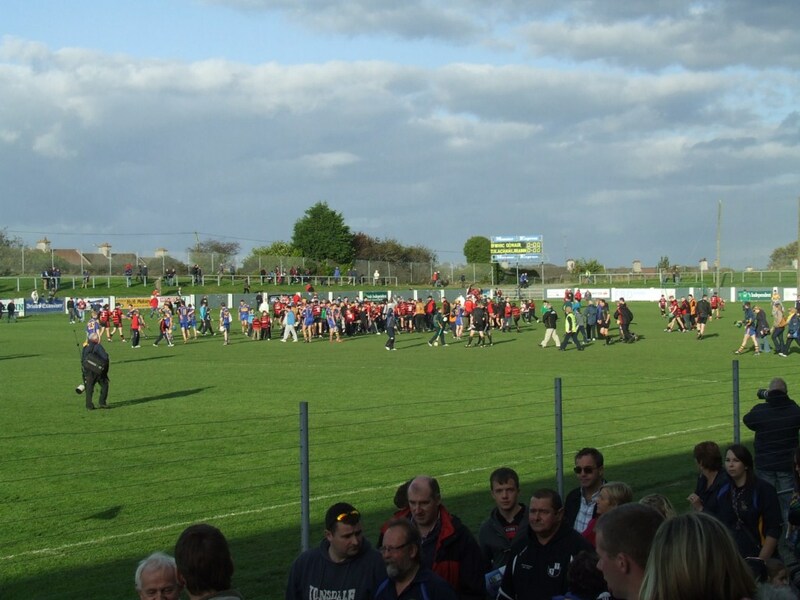 Tortured metaphors aside, it didn’t look too bad for Tallow at the start, especially if you chose to ignore the result of the match between the teams in the regular season – Ballygunner 2-15 (21) Tallow 0-6 (6), if you must know, killjoy. An early free from Pauric Mahony dropped short and was initially won by David O’Brien in the Tallow full-back line only for his shot to be blocked and lobbed back in. This time goalie Shaun O’Sullivan dealt with the danger but his clearance to around the 45 led to a foul on a Ballygunner forward and Pauric Mahony tapped over the easier chance. Tallow responded with a truly excellent point, Eoin Condon picking out Thomas Ryan – not Tomás then? – in the corner and he shot over from an acute angle to level matters. Evan Sheehan had a chance to put Tallow ahead after a good catch but he shot too early and the ball went wide. Pauric Mahony then hit a very long-range free in with a low trajectory which Tallow managed to scramble out for a sideline ball. The cleared ball came to Shane Walsh who went on a mazy dribble. His shot was blocked but he mopped up the rebound to put Ballygunner back in front. Tallow kept up their attempt to win the game by being smart, Ryan pulling low across a dropping ball and causing Ballygunner goalie Stephen O’Keeffe to fumble the ball out for a 65. It will not have escaped the attention of the new inter-county management team that this would be O’Keeffe’s only flub in the game. Paul O’Brien knocked over the 65 and the teams were level again. A longer range effort from him soon afterwards went wide and another free-in, won not long after James Murray had tried to take the creativity thing a bit too far by backheeling the ball, was also missed. It was a much easier chance, the first whatmighthavebeen for Tallow. There wouldn’t be many. Andy Maloney had a huge impact on Ballygunner’s last county final success and he was soon in the mix here, slotting over after finding himself in acres of space out on the right. Another dropping ball from Tallow was cleared with ease by O’Keeffe and struggling to clear their lines nearly caught Tallow out moments later, William Henley’s ball out to the Ballygunner half-forward putting Tallow on the wrong foot. The ball was zipped straight back into Brian O’Sullivan but he dragged the ball across the face of the goal when it seemed easier to hit the target. At the other end O’Keeffe dealt with another dropping ball with aplomb and it was becoming unnervingly clear that Tallow were struggling to use the breeze to put him under the pressure that would be required for them to cause a shock. At the other other end Ken Kearney got into a right flap trying to clear the ball and could only bundle it out for a sideline ball. Ballygunner worked the ball across the field to Harley Barnes who hit the post with a point effort that, like Stephen Jones for Wales against France, shouldn’t have gone anywhere near the post so couldn’t be counted as unlucky. Aidan Kearney’s clearance fell to Pauric Mahony who missed the more difficult follow-up effort but Tallow were running out of get-out-of-jail-free cards. William Henley, who had started so brightly for Tallow, was now struggling against Pauric Mahony who swept past him and gave it to Shane O’Sullivan who drew the foul. Pauric Mahony did the needful and you could see the inter-county players were starting to strut their stuff. And none more so than what David O’Sullivan did next as he set off from near halfway through the Tallow defence. No-one could get near him and he teed up Harley Barnes whose bouncing bomb from close range found its way to the net. JJ Hutchinson scored a good point from the next play and when Barnes shot was blocked Maloney was there to slot over the rebound to leave Ballygunner seven points up. In the space of five minutes Ballygunner had raised twice as many white flags as Tallow had managed in twenty-five minutes. And that doesn’t even include the goal. The road back to west Waterford was getting longer all the time. Tallow tried to respond, a hasty shot going wide and then Paul O’Brien – you really have to keep repeating Christian names when it comes to club reports, teams usually consisting of four or five surnames – pointing from a free Aaron Pratt had been fouled in the corner. The free had been from a tricky angle and it didn’t look like it had gone over. Was this an act of charity from the officials? To make matter worse, O’Brien was visibly limping as he went back into the full-forward position. Again, this is probably a club thing where you haven’t got the resources to cope with the loss of a marquee player and was another ominous sign. 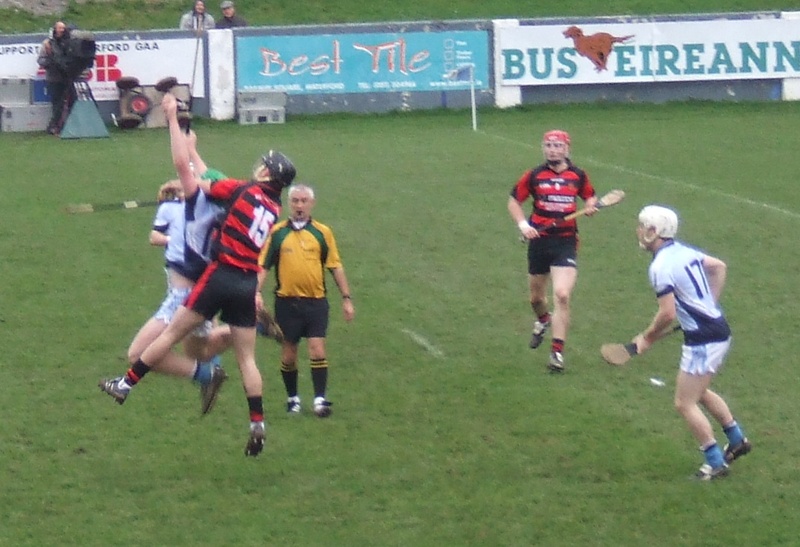 Ballygunner responded briskly to this score, Pauric Mahony putting over a free after Mark O’Brien was penalised for overcarrying, a long range free after a push in a Ballygunner back, and another shorter effort after a foul on him although he was fortunate not to be penalised himself for overcarrying. Three injury-time points, three more nails in Tallow’s coffin. The second half began with Ballygunner showing Tallow what to do with the breeze, quickly putting their goal under pressure with a long ball. Shaun O’Sullivan could only clear as far as JJ Hutchinson who was flattened as he tried to head towards the Tallow goal. Mystifyingly the referee not only failed to award a free but let play go on as Hutchinson lay spreadeagled on the floor. Tallow got the ball down to the other end of the field and O’Keeffe had to clear the ball out for a sideline but it all felt slightly phony as people looked back towards Hutchinson, a Tallow back even having to evade an onrushing Ballygunner medic as they tried to clear. When the dust had settled on that fiasco Mark O’Brien tried to gee up Tallow with a spectacular point, but his effort after a long run from his own half drifted wide. Aaron Pratt, the only Pratt on the Tallow team (sorry) did manage a fine effort to spark some optimistic yahooing from the Tallow faithful who far outnumbered those from Ballygunner but such thoughts were quickly snuffed out, Shane O’Sullivan pouncing on some loose play by Aidan Kearney to cancel that score out and Pauric Mahony knocked over another free to stretch the lead still further. Pratt kept trying to take the bare look off Tallow’s part of the scoreboard with another point after some scrappy play by the Ballygunner backs and they engaged in the time-honoured habit of a team being stuffed by bringing on multiple substitutes but Ballygunner kept picking off the points, a free-out being well gathered by JJ Hutchinson who put Shane O’Sullivan in space to score. Eoin Condon gave Tallow supporters something else to cheer about with a deft Paul Flynn-style flick-and-gather over his bewildered marker but then struck an unFlynn-like effort wide. Incidentally my brother wants a writer’s credit for noting that at the time, to which I say it was hardly an original observation. Pauric Mahony added another free to a quality performance from the place ball and Shane O’Sullivan notched a great score from play, bringing a tricky ball under control at the second attempt then striking the ball over his shoulder. They were twelve points up, they could afford to be cavalier. Tallow tried to keep their spirits up, exemplified by Paul O’Brien hobbling half the length of the field to take a free from which he duly scored what would be their last score. But neither side was truly bothered, exemplified by a Ballygunner sideline daisycutter that a good half-dozen players wouldn’t bend their back for. Tommy Daly, on as a sub for Tallow, released Kieran Geary into space but he got right under his effort on the run and it went wide. Maloney had no such problems from a similar distance after being put clear by Pauric Mahony, who added another free not long afterwards. The game couldn’t have been flatter if it had been passed through a mangle. At one point Bob McCarthy went to give the ball to Wayne Hutchinson for a sideline only to throw it away. Normally this kind of behaviour should lead to a twenty-man pile-up. Instead it barely brought a flicker of recognition from Hutchinson. Another example of the dunderheaded nature of the game was when Tallow got a free about 30m out. Ryan chose to go for goal when a point was the easy option. The shot was blocked out for a 65 which the ref refused to allow be taken short for no discernible reason. Now Tallow went for a point and it was only a superhuman leap from a Tallow forward that prevented it going high and wide. And Ballygunner cleaned up with ease. It summed up the chasm between the teams. All that was left was for Naoise Waldron to stick it to the Ballygunner mentors for not picking him to start – I jest, please don’t write in – with a point, Kevin O’Brien to drill the ball wide after a nice Tallow move (it was, in fairness, a definite goal chance), Pauric Mahony to score another free and Shane O’Sullivan to score another point from play. And that, mercifully, was it. It shows how much time I have on my hands that I’ve managed to cobble together a couple of thousand words from this horrible mismatch, although if you’ve read down this far then you have too much time on your hands. It was a demoralising experience. I’m not so passionate about a desire for new teams or winners out West that Tallow losing will keep me awake at night. But I am passionate enough about Waterford to be concerned about our county champions and how they will do in the Munster and All-Ireland club championship, and the sad truth is that the Gunners do not inspire confidence. This game probably doesn’t tell us much, but their repeated mis-steps and rank bad luck in the Munster championship mean that I was looking for a swashbuckling performance from them which, even discounting the quality of the opposition, I didn’t get. I got something though – the knowledge that there is such a thing as a hurling match that isn’t worth the time and money invested in it. Who knew? This entry was posted in Hurling, Match Reports, Waterford and tagged Ballygunner, County Championship, Tallow on 17/10/2011 by deiseach. 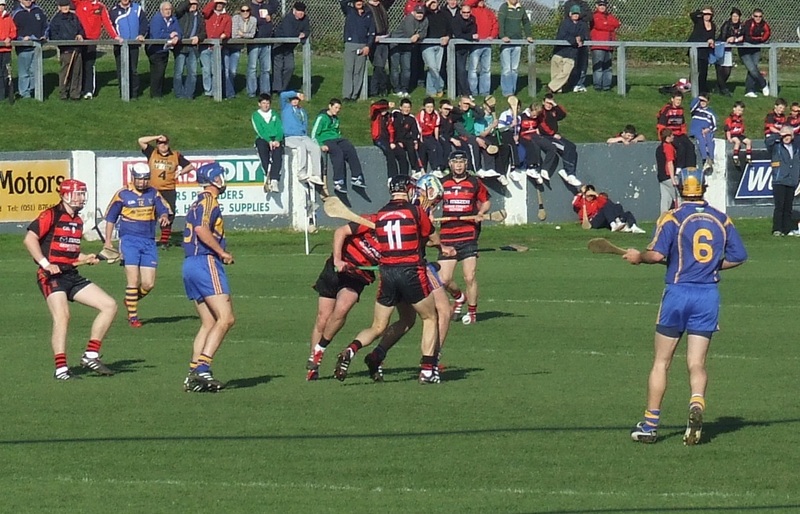 This entry was posted in Hurling, Waterford, Waterford gallery and tagged Ballygunner, County Championship, Tallow on 16/10/2011 by deiseach. Given the seeming need for sportsmen and women to get ‘fired up’ by the loose talk of players and pundits alike, allow me to give Tallow something to get their teeth into: the real county final was played in Walsh Park yesterday with Ballygunner toppling the defending champions and, alas, our best hope for winning the All-Ireland club title. Now I’m just giving Ballygunner something to get wound up over. Never accuse me of not being an equal-opportunities stirrer. It’d be marvellous if Tallow could win their first title in 26 years. Heck, it would be marvellous just for being only the second time the county cup has gone West since Lismore won it in 1993. It’s not going to happen though, is it? On a more cheerful note there a few greenhorns moving into the Munster club championship mix, with Na Piarsaigh in Limerick winning their county title for the first time ever and Carrigtwohill winning the Cork title for the first time in an- eye-watering 93 years. Intriguingly their coach is one Joxer O’Connor (h/t to Jamie O’Keeffe for that). One more in the county manager mix? Although if the Powers That Be were unaware of his existence before now then they really haven’t a clue what they’re doing. It seems a bit harsh on Tallow to dragging them across what is literally the entire county when there is a venue that would be almost equidistant between the two. Not that I’m complaining. See you there. 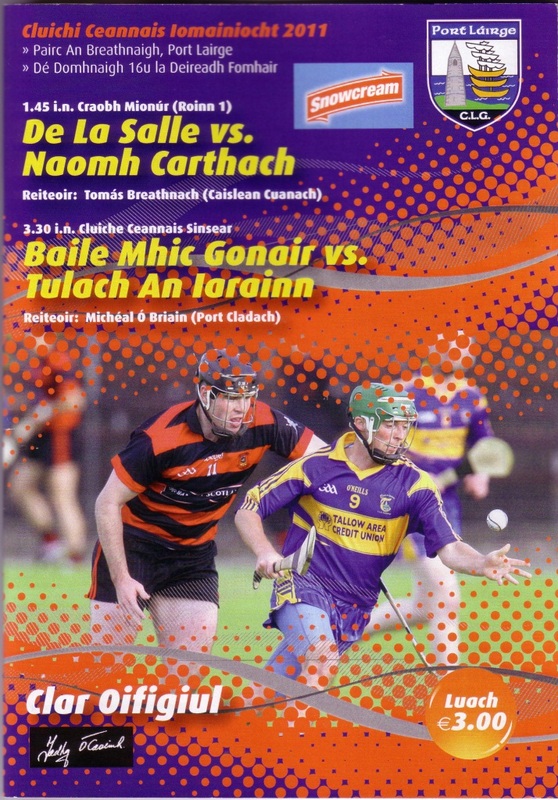 This entry was posted in Hurling, Waterford and tagged Ballyduff Upper, Ballygunner, County Championship, De La Salle, Tallow on 03/10/2011 by deiseach.